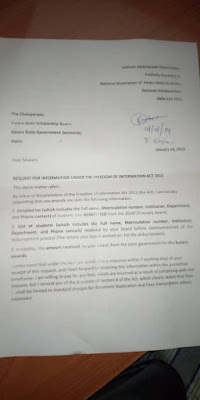 The Kwara State scholarship board may be drag to court in coming days. 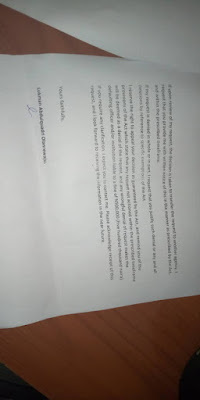 This was coming after the National Publicity Secretary 2 of the apex indigenous body in Kwara, Comr. 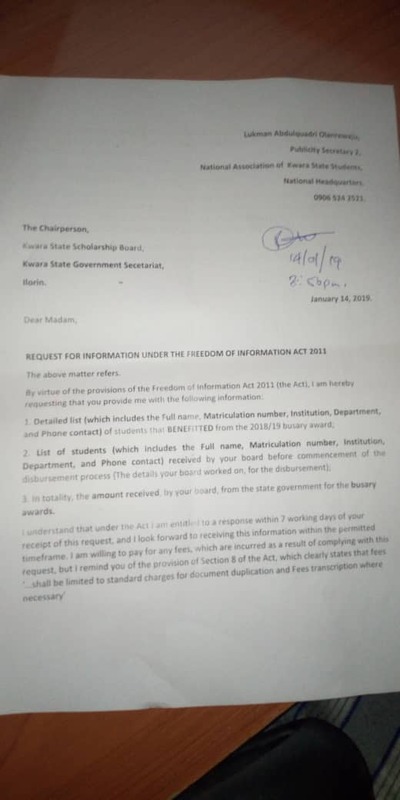 Lukman AbdulQuadri Olarewaju wrote a letter, being guided by the Freedom of Informantion act, mandating the scholarship board to release the list of students that benefitted form burasry. 3. The amount received from the state government for the busary awards." "I understand that under the Act I am entitled to a response within 7 working days of your receipt of this request, and I look forward to receiving this information within the permitted timeframe. I am willing to pay for any fees, which are incurred as a result of complying with this request, but I remind you of the provision of Section 8 of the Act, which clearly states that fees ‘…shall be limited to standard charges for document duplication and Fees transcription where necessary’"
"If upon review of my request, the decision is taken to transfer the request to another agency, I request that you provide me with written notice of this in the manner as prescribed by the Act, and within the prescribed timeframe." "If my request is denied in whole or in part, I request that you justify such denial or any and all deletions by reference to specific exemptions of the Act." It continues, "I reserve the right to appeal your decision as guaranteed by the Act, and remind you of the provisions of the Act which state that any request not actioned within the prescribed timeframe will be deemed as a denial of the request, and any wrongful denial of request makes the defaulting officer and/or institution liable to a fine of N500,000 (Five hundred thousand naira)." However, under the act, any applicant, who has been denied access to information, or a part thereof, may apply to the Court for a review of the matter within 30 days after the public institution denies or is deemed to have denied the application. The applications to the court are heard summarily. This is to ensure the prompt and expeditious disposal of the case. 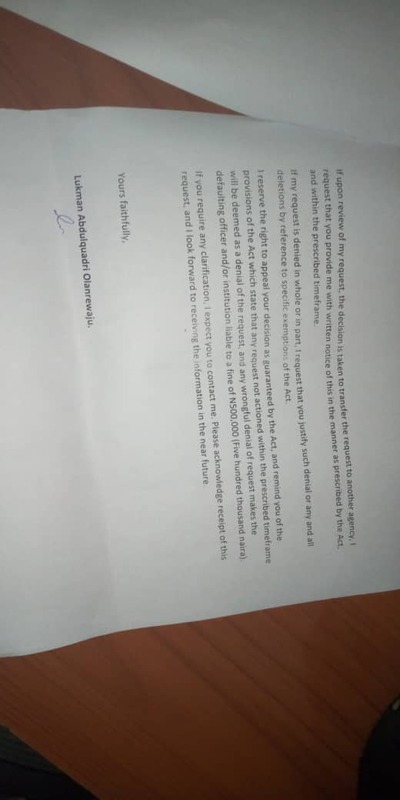 If the court finds that the request should not have been denied, the defaulting officer or institution commits an offence and is liable on conviction to a fine of N500, 000 . Further, the court will order that the information be released as per the request. It should also be noted that it is a criminal offence punishable on conviction by the Court with a minimum of 1 year imprisonment for any officer or head of any government or public institution to which this Act applies to wilfully destroy any records kept in his custody or attempt to doctor or otherwise alter same before releasing the information.